Sehr schönes Chalet "Aquarius", auf 3 Stockwerken, Baujahr 2008. Im Ort, 300 m vom Zentrum, am Hang, in einer Sackgasse. Zur Alleinbenutzung: Garten Rasen. Grill. Im Hause: Sauna, Skiraum. Sehr steile Zufahrt. Im Winter bitte Schneeketten mitbringen, im Winter 4x4 empfohlen. Parkplatz, Einzelgarage. Einkaufsgeschäft, Restaurant 300 m. Golfplatz 15 km, Gondelbahn 500 m, Skibushaltestelle 300 m. Bekannte Skigebiete sind gut erreichbar: Nendaz Tracouet 300 m. Wandergebiete: Bisse du Milieu 500 m. Bitte beachten: Für Kleinkinder nicht geeignet. Gratis Skibus. "Chalet Aquarius", 6-Zimmer-Chalet 245 m2 auf 3 Stockwerken. Modern und geschmackvoll eingerichtet: grosses Wohn-/Esszimmer 85 m2 mit Panoramafenster mit Schwedenofen, Kabel-TV, CD und DVD. Offene Küche (Backofen, Geschirrspüler, 5 Induktionskochplatten Mikrowelle, elektrische Kaffeemaschine, Kapseln für die Kaffeemaschine (Nespresso) extra, Racletteofen, Fondue Set (Käse)). Sep. WC. Unteres Geschoss: 1 Zimmer mit 1 Doppelbett (2 x 90 cm, Länge 200 cm), Dusche/WC. 1 Zimmer mit 2 Betten (90 cm, Länge 200 cm). 1 Zimmer mit 1 Doppelbett (2 x 90 cm, Länge 200 cm). Bad/Dusche, sep. WC, Sauna. Obergeschoss: 1 Zimmer mit 1 Doppelbett (2 x 90 cm, Länge 200 cm), Dusche/WC. 1 Zimmer mit 1 Doppelbett (2 x 90 cm, Länge 200 cm), Dusche/WC. 4 Balkone, Nordostlage und Nordwestlage, Terrasse, Westlage. Terrassenmöbel, Gartengrill, Liegestühle (4). Panoramasicht auf die Berge, das Tal und die Ortschaft. Zur Verfügung: Waschmaschine, Wäschetrockner, Babybett, Haartrockner. Internet (Wireless LAN, gratis). Parkplatz (2 Autos), Garage (2 Autos), Höhe 200 cm, Breite 245 cm. Bitte beachten: Nichtraucher-Unterkunft. My family and I have very much enjoyed and loved our stau at Chalet Aquarius. Its a clean, modern, comfortable and nicely designed. Basically its superb and would love to bring the family back once again. Great Place with breathtaking round view ! 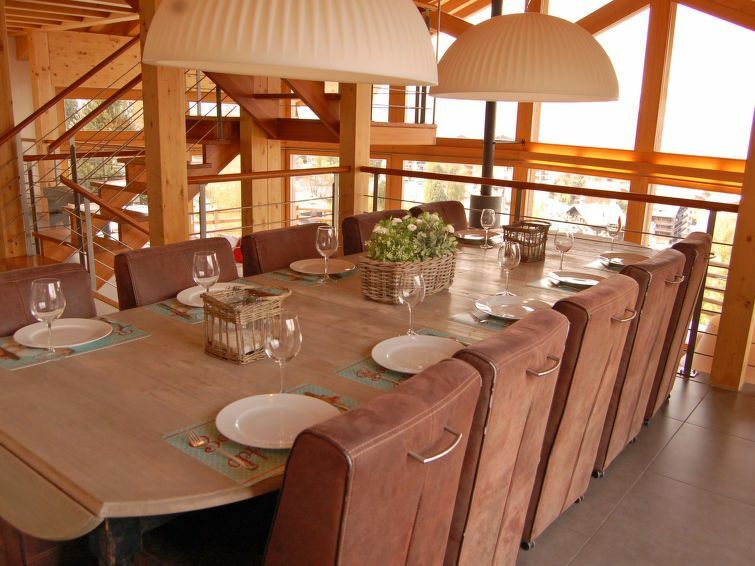 We spent a wonderfull week in this extraordinary chalet with its light and clear very attractive architecture. A lot of room for a big family (4 children and 6 adults)with valuable and nice equipments. We will absolutely recommend this beautiful "Chalet Aquarius"! We had such a wonderful time with plenty of sunshine, good skiing (sometimes with the ski piste just for us!) and spectacular views from your beautiful living room. This year we were lucky that all of our children, who all but one live abroad, were able to extend their Christmas holidays and spend this week together in such a delightful place. You truly have a little gem here tucked away in the magnificent mountains of the 4 valleys. My family and I recently stayed for a week at Chalet Aquarius in Nendaz. We were a group of 10 which included children. The owner has paid attention to the smallest detail as the layout of the chalet is extremely efficient and the chalet has everything that you need in order to enjoy your vacation. The owner was very responsive to all of our requests and extremely professional through the entire process.